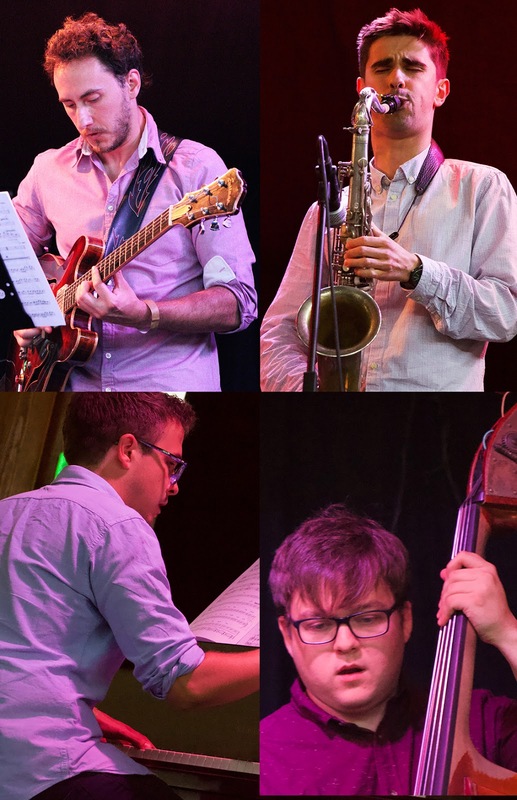 Tenor saxophonist and clarinettist Sam Rapley’s Fabled illuminated his through-composed works with improvisatory flair in a line-up with Alex Munk (electric guitar), Matt Robinson (piano), Conor Chaplin (double bass) and Will Glaser (drums). 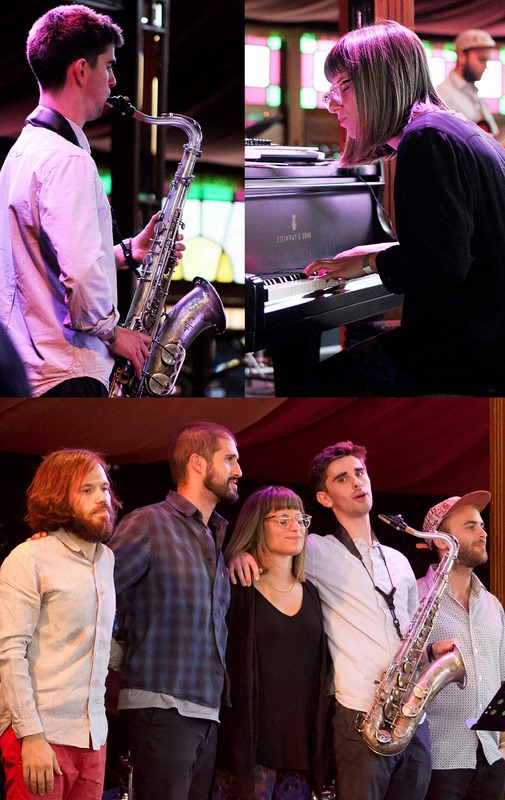 Releasing an album around the end of September – and a relief to see Rapley on good form following his recovery from two broken arms – they deftly blended subtle textures and hit rocky grooves through numbers such as Dovestone, 25 Years of Rain and The Picturehouse. Maria Chiara Argirò’s The Fall Dance album is both classy and exhilarating – and the pianist/keyboardist, with her ensemble of Sam Rapley (for the second time that day), Tal Janes (electric guitar), Andrea Di Biase (double bass) and Gaspar Sena (drums) took the opportunity to preview numbers from their upcoming sea-themed release, which will again feature the creative vocalisations of Leila Martial. Ocean and Nautilus were restless and airy, portrayed through undulating ostinato piano and arco bass melodies, whilst Tal Janes added sparkling, shimmering guitar waves to pieces such as Watery Universe and Sea Song. 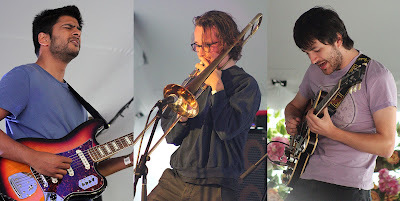 The breezy summertime grooves and vocals of Big Bad Wolf were enjoyed by those crowding into the free stage tent, as guitarist Rob Luft, trombonist Owen Dawson, bassist Michael De Souza and drummer Jay Davis spread contemporary sounds – taken from their debut album Pond Life – around the bustling street scene. Luft is an extraordinary guitar talent, and this instrumental combination has great cross-genre appeal. 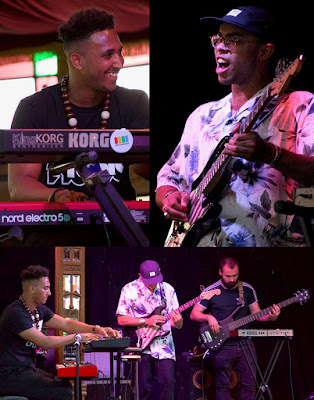 A change to the original programme brought Catford-based Project Karnak to mjf – keyboardist Dominic Canning, guitarist Alex Blake, bassist Martin J Stephens and drummer Sam Ouissellat. Having explained they journey from humble musical beginnings as sixth formers, it was clear that their resonant, soulful urban grooves – at times, akin to Snarky Puppy – were a hit. Their delight and rapport with the empathetic late afternoon audience as they played the earthy basslines, electronic effects and soaring guitar numbers of their Equinox EP made them a great surprise package at the festival. Artistic Director Steve Mead traditionally throws an ‘end-of-term’ party, and this was surely up there with the best as he welcomed back two previous festival favourites – the magnetic personality of singer/guitarist Namvula, followed by the outrageous fervour of Hackney Colliery Band. 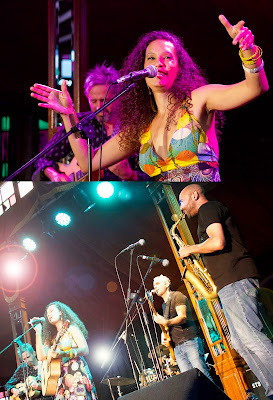 Namvula’s Zambian heritage and infectious jazz/world music grooves lit up the evening, conjuring energetic feel-good with saxophonist Chris Williams, guitarist Phil Dawson, bassist Liran Donin and drummer Yuvan Wetzler, even jumping down to dance with the partying crowds. Hackney Colliery Band are one of the most blistering, epic big/brass bands on the jazz circuit, and their brash, punkish, full-throttle performance – from double trumpets, trombones and saxes, a thunderous percussion duo, plus sousaphone – delivered a raft of originals from their last album and a great cover of Nirvana’s Heart-Shaped Box. Announcing an upcoming project collaboration with names from jazz and rock, charismatic trumpeter Steve Pretty led the band as they parted the crowd down the middle to leave an indelible impression all around. 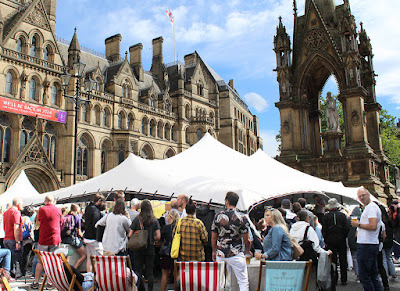 The date of the 24th Manchester Jazz Festival has been announced for earlier in 2019 – 23–27 May – at a change of city-centre location to be confirmed (due to extensive refurbishment of the town hall and square). There is no doubt that this year’s festival has communicated live jazz in its many forms to a wide audience – and that must be applauded.